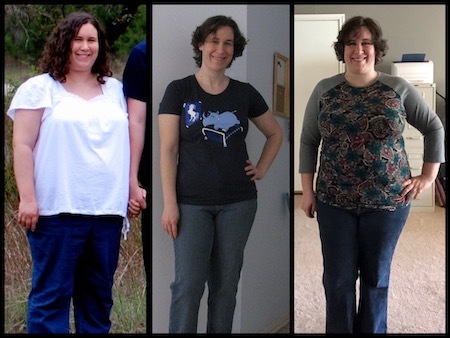 November 27, 2009 – Several things came together to start my original weight loss journey. I’d joined an exercise challenge in early October, but hadn’t done well because my body weight was the highest it had ever been and exercise with any impact was HARD. So on that day, I got rid of my treadmill and bought an elliptical instead. Later that day, I went out with three friends, one of whom had been learning about intuitive eating. Between the exercise challenge to push me, the elliptical to help me exercise, and the advice on eating intuitively, I began to lose weight. The first fifteen months were very slow, until I discovered new things about health and nutrition, and after that, it was all downhill (in a good way!). In 2010, on my first weight loss anniversary, I was down 15 lbs. In 2011, I was down a total of 66 lbs. 2012: -95 lbs. 2013: -105 lbs. 2014: -99 lbs. That’s about when I started struggling with stress and binge-eating and regain. The numbers got worse. 2015: -50 lbs. 2016: -35 lbs. 2017: -29 lbs. Never fully up to that highest weight again, but far closer than I ever wanted to be! And now it’s 2018, year nine, nearly a decade after I began. I truly wanted to have some major improvement between last year and now, especially since I wouldn’t be moving across the country halfway through the year again. Alas, my 2018 total clocks in at -29 lbs, exactly the same as last year. I definitely share all of the same goals! I am not back at my highest either, but too close to it for comfort. I’m hoping now that we have a treadmill and I’m done having babies, I can really re-focus. Good luck to you. We can do this. We’ve both done it before and WILL do it again. I certainly hope so. My body is so stupid about weight loss. It took over three years of constant work and vigilance last time! Hang in there! I’m a very firm believer that the process is what makes the final result sweet! You and I both know that you will get to the goal weight you wish to be. Right now you’re just getting the story straight to tell when you win! It’s a better story and shows so much more of who you are that you went through so much but kept up the fight! I believe in you and you do too and when it’s all put together you will win! Most important at whatever weight you have ever been at you have looked very pretty. You have a good look my friend and I’m sorry but your size doesn’t change that. I know it’s important for health and happiness that you attain your goals, I just hope you keep in mind that your a Queen no matter what size! Keep smiling and grinding and you will get there I have no doubts! Just got to keep trying new things is what I guess. Eventually something will give! I don’t really mind the way I look so much, not in terms of looking good or bad or anything – I just want to look like myself! !